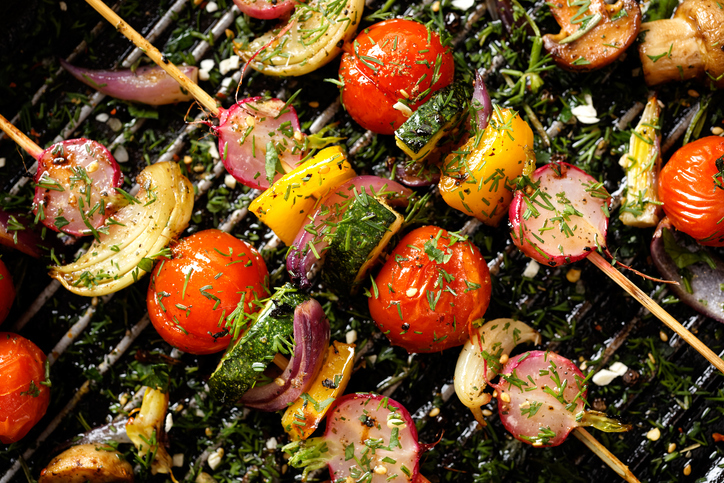 Here’s how to “green” your average barbecue for an outdoor shindig that’s fun and Earth-conscious! Come summer, the Earth and its atmosphere gets hit hard with excess CO2 and smog. There’s the increase in air conditioning, which drives up power plant emissions and the fumes from mowers and lawn equipment are responsible for about 20 million tons of CO2 a year. Even the heat alone can cause problems. Ozone is temperature-sensitive, so when the heat skyrockets, it can trap pollution and smog. Even America’s favorite pastime, the backyard barbecue, isn’t immune. 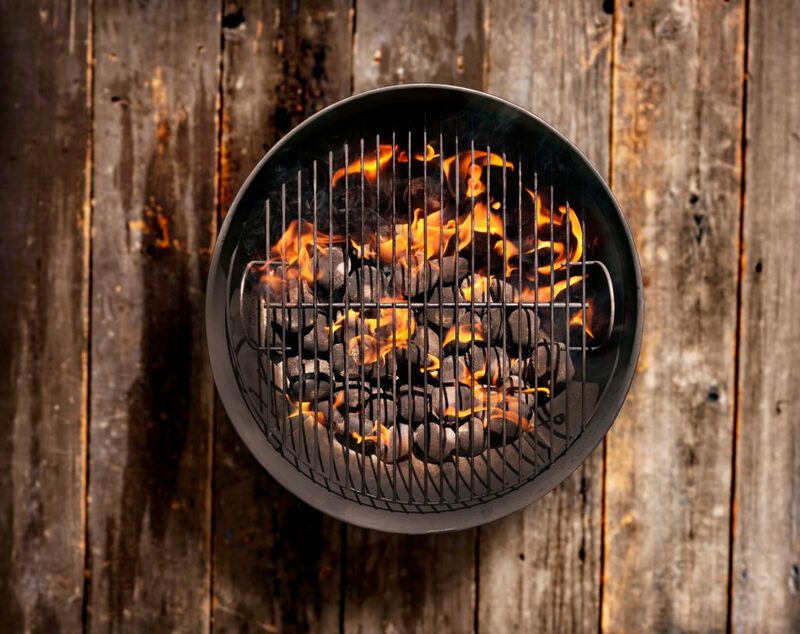 Charcoal grills, in particular, emit quite a bit of greenhouse pollutants pound-for-pound, mainly because burning briquettes is a fairly energy-inefficient cooking technique, at least compared to gas grills or conventional ovens. Charcoal grilling burns much more fuel than necessary to get a good char on a couple of hot dogs and burgers, and the smoke from charcoal nuggets releases up to 11 pounds of carbon dioxide every time you grill. By comparison, a propane grill nets about half of that, but it’s still got a hefty carbon footprint in its own right. Which Is Greener—Gas or Charcoal? Many green-thinking grillers wonder which fuel source is better for the Earth. You might think that charcoal would be greener. After all, charcoal—which is essentially superheated wood—counts as a natural biofuel, whereas propane is a byproduct from natural gas refining. But propane grills heat food a lot more efficiently than charcoal, which means they consume less fuel every time you turn them on. And there’s no waiting for the coals to burn down with a propane grill; you simply shut it off and it’s no longer emitting chemicals. Adding to charcoal’s poor environmental performance is that fact that the majority of charcoal briquettes are produced from harvested green wood. This means that the world’s forests must make the ultimate sacrifice so you can enjoy that burger. If you’re like most Americans, though, you probably prefer the way charcoal grilling feels and tastes. So if you’re determined to stick with briquettes, you can still avoid some of the deforestation issues by choosing green charcoal made from sustainable coconut husks. However, if you’re trying to decide between propane and charcoal, you’re better off with the gas — at least environmentally-speaking! Gas and charcoal are easily the most popular choices for outdoor cooking, but they’re not the only choices. 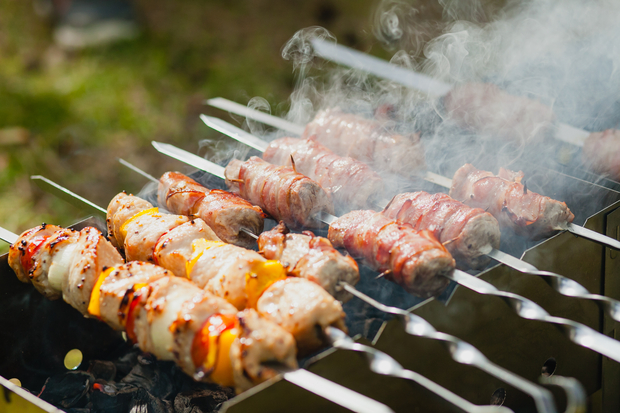 Electric grills are much safer and don’t have the carbon footprint—as long as you use a cleaner fuel to power your home, like solar or wind power. Otherwise, the Oak Ridge National Laboratory says electric grills rack up even more emissions than propane does, when you count the carbon consumed by coal-fired power plants. Electric grills, ORNL found, emit 15 pounds of CO2 per hour when powered this way. That’s no picnic, either, unfortunately. However, solar-powered cookers and grills offer a fourth alternative. Solar cookers use advanced reflective techniques to funnel the heat of the sun into your food, thus giving it a low-and-slow burn that cooks almost anything you need to on a grill while using absolutely no fossil fuels. Keep your eyes peeled for solar-thermal grills, too, which are currently being developed at MIT, and would make nighttime solar cooking a reality. Okay, the idea of green meat doesn’t exactly sound delicious, but this is one case where a little green in your burger isn’t necessarily a bad thing. While you definitely shouldn’t feel guilty about the occasional indulgence, red meat in particular has a pretty bad environmental record. Beef produces eleven times the greenhouse gasesthan other barbecue staples like pork or chicken, and it requires a great deal more water and land, too. In fact, experts say that ditching cows as a food source would do more good for the environment than giving up cars! Choosing greener alternatives like turkey burgers, chicken, or pork ribs, or even supplementing your spread with veggie burgers or grilled vegetables, could make a huge difference here. If you must have your beef, find a local farmer who runs a well-managed grass-fed cattle operation. By shopping local, you’ll offset some of the carbon used to transport meat long distances to the grocery store. And you’ll probably get fresher food for your trouble. All in all, it’s important to recognize that grilling makes up just a small portion of carbon emissions every year. So even if you grill the old-fashioned way, if you only do it every once in a while, you’re probably not causing too much harm. Just being aware of your options and the impact you’re having on the earth is a great step forward! So until next time, here’s to the chef!